The northern region of India comprises the valley -filled Kashmir to the vast field- lands of Punjab. The cuisine also varies widely in this region but the predominant one is the Mughlai one. The staple food of the Kashmiris is rice and plenty of meat dishes, which includes "Gustaba", "Kaahwa", etc. The Kashmiri cuisine is a blend of its major produce, which includes red chillies, fruits, nuts, saffron and rajma. For the Punjabis, the Rotis and Lassi give them the vigor and energy they are noted for. The sarson ka saag and the makke di roti is a good combination. The Punjabis also place a lot of stress on the ginger, garlic, onion and tomato combinations. Altogether the northern part is famous for its tongue tickling Mughlai dishes. They are a gift to us from the Mughals who probably got it from their Persian ancestors. The succulent kababs, kormas and the parathas are good examples. The blending of spices over low heat is an important factor of the Mughal style of cooking. Most of the vegetarian and non-vegetarian dishes are famous for their distinctive tastes. Though rice is sparingly used throughout northern India, Wheat is their staple food. They take wheat in the form of rotis and chappathis. They come in a wide range, which includes parathas, puris, naans, kulchas, rotis and chapathis, and stuffed parathas. With the flour add some water and knead into smooth dough. Heat oil in a pan and fry the onions till pink. Also fry the ginger garlic paste and keep aside. Cook the minced meat, salt, red chilli powder and ½ cup of water till the meat is cooked and dry. Add tomatoes to the egg and also salt and make two omelettes. Take two portions of the dough and make two thin chapathis. On one chapatti place one omelette, spread a tablespoon of minced meat over it, sprinkle some green chillies and coriander and cover with the other omelette. Top this with the next chapatti and press the edges of the two chapattis tightly. In a tava fry the paratha with a little oil, till both the sides are well done. Serve hot. Mix the flour, baking powder, salt and sugar well in a bowl. Mix the yeast with 2 tablespoons of milk and warm the remaining milk. Add the warmed milk to the yeast with 1-½ tablespoons of butter and mix well. Pour the yeast mixture into the maida and knead well to form smooth dough. Cover it with a cloth and keep aside for 2 hours. Divide the dough into 8 portions with floured hands, cover and keep for some 15 minutes. Flatten the balls into circles of 5 inches diameter and brush the top with melted butter and sprinkle some poppy seeds over it. Place the dough circles in a greased baking tray and bake for 10 minutes at 230 degrees till the naan is puffed. Mix well the flour, baking powder and salt. Rub the flour with 2 tablespoons of oil and make it into a smooth dough. Divide the dough into 8 balls and and roll them into flat thick rounds. Apply little oil, sprinkle some flour and fold it into semicircle. Again apply some oil and flour and fold it lengthwise. Roll it, press down and roll out into square of 8 inches by 8 inches. Brush the surface of the paratha with beaten eggs and turn all four corners towards the center. Heat a girdle and apply oil liberally. Cook the paratha in it applying oil along the edges. Fry on both the sides till brown patches appear and serve hot. Cut the meat into small cubes after washing. Heat the oil in a pan and add the meat along with the rest of the ingredients. Seal the pan and cook for 45 minutes without adding any water. Open the pan, add 2 teaspoons of ghee and fry the meat till it is reddish brown in color. Cook the mutton with all the ingredients except the saffron, flour and ghee. Saute the flour with ghee in a pan for sometime. Then gradually add some water to form a batter and add that to the gosht and keep stirring for 5 minutes. Add saffron and cook for another 5 minutes. In another pan heat oil, add the onions, garam masala and bay leaf and fry till brown. Add the green peas and the red chillies and stir for 2 minutes. Then add the gosht and mix well and remove from fire. Garnish with onion rings, coriander leaves and lemon wedges. Clean the pomfret and make small slits on the flat sides and add some salt and keep aside. Grind the rest of the ingredients and fill in the slits very liberally. Grill for 5 minutes on medium flame on each side. Heat oil in a pan and add oil, bay leaves, red chillies, coriander seeds, garam masala and roast till they splutter. Add the onions and saute for sometime till it browns. Add the ginger, garlic paste and fry till the oil floats on top. Add the tomatoes and continue cooking. Add the Kashmiri chilli powder and cook for some time. Now add the chicken and stir a little, then add some water for cooking. When cooked remove form fire and garnish with chopped coriander leaves and fried Kashmiri red chillies. Slice the tops of the capsicums and scoop the pulp inside. Apply some salt and keep upside down for sometime. Grind the ginger, garlic and other masala items to a fine paste. Add this to the fried onions and also add the mince prawns. Then add the chopped tomatoes and chopped coriander leaves and fry well. Fill this mixture into the capsicums, attach the stalks and seal the opening with gram flour. Now dip the capsicum in beaten egg, roll it over the breadcrumbs and deep fry till golden brown color. 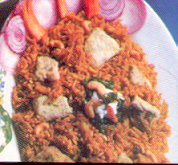 Most of the parties in the north are incomplete without a biryani or pulao. In olden days in India, biryanis were made in huge earthern pots and served with wooden spatulas, which gave them a distinct aroma and taste. But nowadays, the modern Indian woman too makes such delicious meals using her modern gadgets in no time, which the earlier cooks used to take hours. Biryanis and Pulaos are mostly of Chicken and mutton, but there are varieties for the vegetarian too. Heat ghee in a pan and add the garam masala and the shahjeera. Saute, add the onions and fry till brown. Add the ginger, garlic paste, salt and chilli powder, fry and then add the chicken pieces. Put the curd and saute for 2 minutes. Add 500 ml of water and bring the mixture to a boil, cover and cook till the chicken is done. Take1 litre of water in a pan and bring it to boil. Then add the rice, the remaining garam masala and salt and cook till the rice is half done. Sprinkle half of the cream, browned onion, mint leaves, coriander leaves and saffron over the chicken preparation. Then spread half of the rice over the chicken. Repeat the layers and cover it with a moist cloth. Put the sealed pan in a pre-heated oven for 15 to 20 minutes and serve hot. Basmati rice 350 gms, washed and soaked for 30 minutes. Heat the ghee in a pan and season with the whole garam masala. Add the chopped onions and fry till brown. Add the mutton, ginger, garlic paste and saute for 5 minutes. Add the curd and fry for another 5 minutes. Add the remaining ingredients and fry for 2 minutes and then add water and cook till the meat is done. In 1 litre water take salt, cinnamon, cardamom, cloves and lemon juice along with the rice and cook till half done. Take the yakhni and put it on low fire. Sprinkle some chopped coriander leaves and add the rice on top. Cover with a moist cloth and seal it and put it on dum for 15 minutes. 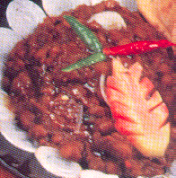 Garnish with browned onions and serve hot with raitha. Fry the onions in a pan with the ghee till brown. Fry the cashews and raisins and keep aside. Add cloves, cinnamon, peppercorns and cardamoms and fry for a minute. Then add the rice and fry on low heat so that the rice grains are coated with the ghee. Add the green peas and fry for another 3 minutes. Add salt and cover the rice with double its amount of boiling water. Bring to a boil and then simmer till the water is absorbed. Garnish with the fried cashews and raisins and serve hot. Saute the garam masala in a pan with the ghee till it crackles. Add the onions and fry till brown. Add half of the ginger, garlic paste green chillies, chilli powder and salt and saute for 5 minutes. Add the vegetables and fry till they a re well coated with the masala. Add water and cook till the vegetables are done. In one litre boiling water add salt and some whole garam masala and rice and cook till half done. Take the pan with the cooked vegetables and sprinkle half of the ginger juliennes, green chillies, saffron milk, mint leaves, coriander leaves and spread half of the rice over the vegetables. Repeat the layers and cover with a moist cloth. Seal the pan and put on dum or in a pre-heated oven for 15 minutes. 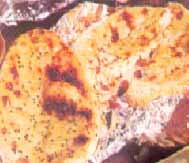 Most of the Kababs, which we relish these days originated in the northern part of India. They are believed to be brought into India through the Persian connection of the Mughals but were later modified according to the local tastes. Kababs consist mostly of minced meat with maslas which are essentially roasted over charcoal fire to give them their distinctive aroma and taste. 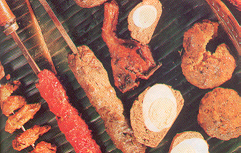 Nargisi Kofta, Kathi Kofta, Hariyali Kofta, Pathat Kabab are some of the notable varieties. Grate the Paneer and mix with the palak puree. Add the salt, pepper, garam masala and other powders along with the cornflour and mix well. Divide into equal sized balls and grill in the oven, frequently basting with oil. Serve hot with onion rings and mint chutney. Mix all the ingredients except the egg. Add the raw egg and blend well and shape into oblong pieces. Boil 2 glasses of water in a shallow pan and while boiling gently slide the kababs inside it. Let it simmer till the whole water evaporates. Then deep-fry the kababs in a shallow pan till brown. Clean, shell and devein the prawns. In a bowl mix all the ingredients except the egg and oil. Beat the egg and blend well with the mixture. Shape into kababs and deep fry and serve hot. Roast the sesame seeds and the poppy seeds till brown and pound them well. Fry the onions in the oil till brown. Grind the sesame, poppy powder, tomatoes and coconut gratings into a fine paste. Cut the brinjals into long and thin slices. Fry the brinjal pieces till soft. Add cloves, cardamoms and bay leaves to oil and also the coriander and mint laves for flavor. Add ginger, garlic paste, coriander powder and fry for a minute. Add the ground masala paste to the above and fry for 3 minutes. Add chilli powder, salt, turmeric powder and garam masala and fry till the oil floats on top. Add the fried brinjals and cook on low heat for a few minutes covered. Paneer 50 gms, diced and fried. Fry the onions. Add the ginger, garlic paste and fry for another 2 minutes. Add the tomatoes, turmeric powder, coriander powder, chilli powder, garam masala and salt and fry for 5 minutes. Add all the vegetables, milk, cream and fried paneer and cook for a few minutes till the vegetables are done. Soak the Kabuli chana overnight. Tie the ingredients for the pouch in a muslin cloth. Cook the chana with the soda powder and 1 litre of water. Add 4 tablespoons of oil and the pouch and simmer until cooked. Heat the remaining oil and add the ajwain, stir till it crackles. Add the gram flour and stir till the aroma comes. Add the rest of the ingredients and stir for a minute. Garnish with the items mentioned for garnishing and serve with kulcha. Blend the curd, garam masala, salt, turmeric powder, red chilli powder and half of the chopped green chillies. Trim the bhindis and make slant slits in them. Soak the bhindis in the curd mixture for10 minutes. Heat oil and fry the ginger, garlic paste, green chillies. Add the bhindis with the curd mixture and cook for 10 minutes. Top with the ghee and garam masala and steam on low heat for 5 minutes , covered. Cook till dry and garnish with tomato slices, onion rings and serve hot. Boil the milk so that it reduces to half its quantity. Add the rice flour to this and mix well so that no lumps are formed. Add the sugar and cook for sometime so that the sugar dissolves. Dissolve the saffron in warm milk and add this to the above mixture. 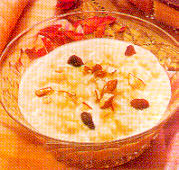 Pour the phirni in earthen bowls and garnish with pistachios and almonds. Allow it to cool and set in the refrigerator and serve cold. Dissolve the cornflour in the milk to from a paste. Boil the rest of the milk and add the cornflour paste and cook till the mixture thickens. Remove from fire and add the powdered cardamoms, almonds and pistachios and cool. Cool it in the fridge for 8 hours to set after pouring the mixture in kulfi moulds. Mix the flour, salt and curd to get a thick batter. Allow the mixture to ferment for 7 hours. Boil the sugar to get a syrup. Cool and add the rose water to this. To the batter add the soda powder and mix well. 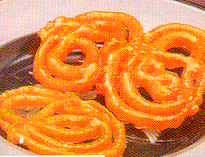 Heat the oil for deep frying and force the batter through a piping bag to form spirals. Deep fry till golden brown and soak it in the sugar syrup and serve.